7. 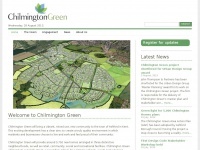 Chil­mington Green Deve­lop­ment Gi­ven Green Light /index.php/chil­mington-green-deve­lop­ment-given-green-li..
8. Chil­mington Green wins presti­gious in­dustry a­ward /index.php/chil­mington-green-wins-presti­gious-in­dustry-..
9. Chil­mington Green part of 500 mil­lion bid to deve­lop county /index.php/chil­mington-green-part-of-500-mil­lion-bid-to.. The web server with the IP-address 85.233.160.150 used by Chilmington-green.co.uk is run by Namesco Hosting THE and is located in Great Britain. There are many websites run by this web server. The operator uses this server for many hosting clients. In total there are at least 387 websites on this server. The language of these websites is mostly english. The content management system WordPress in the version 3.4.1 is used. The markup language of the website is XHTML 1.0 Strict. The visitor analysis software Google Analytics is used to analyze the visitors of the websites. The website does not specify details about the inclusion of its content in search engines. For this reason the content will be included by search engines.